If David Lynch walked into Twin Peaks, he'd likely sue them for copyright infringement, then realize what was going on, commend their clever pun, and hang out while watching attractive waitresses climb walls before serving him a ribeye pot roast. Ski lodge? Ben Horne-owned lodge where he digs holes in the ground and thinks he's in the Civil War? Who cares? 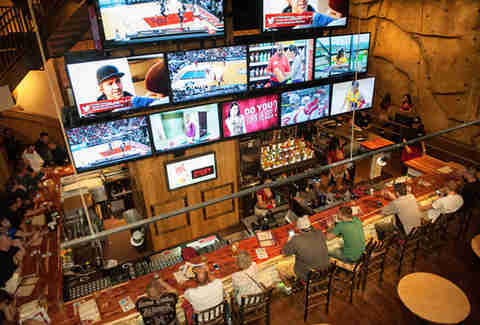 It's a damn lodge, and it's got a two-story TV wall. 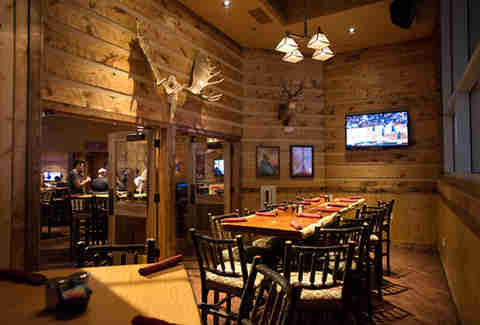 Dining areas also all have TVs close by, and feature a collection of chandeliers with antlers, and animal heads with the same. A serious lineup of classic American beers are kept at a strictly-monitored 29 degrees. Scientists suspect that's even colder than the Coors Light Love Train. Shotski!!! Cheer up, old dude. Look, they like you! Ask the ladies about their selection of 18 bourbons, whiskeys & Scotches, plus shots like the Crown Maple (Crown Royal w/ a hit of syrup), and The Divorce, which makes you drop Firefly Sweet Tea Vodka into lemonade, and drop your possession of the summer home in Narragansett. Somewhere in this photo, there are BBQ pulled pork nachos. 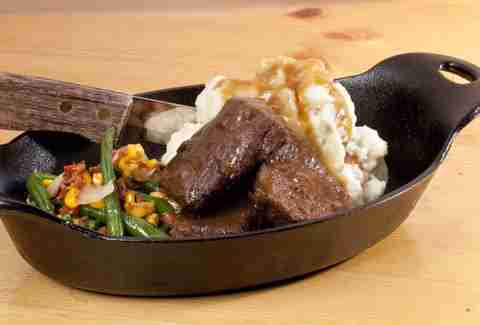 Same for the flat iron steak. Refusing to be overshadowed, here's the ribeye pot roast. Don't want to get your filet on? Then get your belay on!! Eh, whatever. Hey Bambi.